There are approximately 652 miles (1,050 km) between the most recent violence and our wedding location. 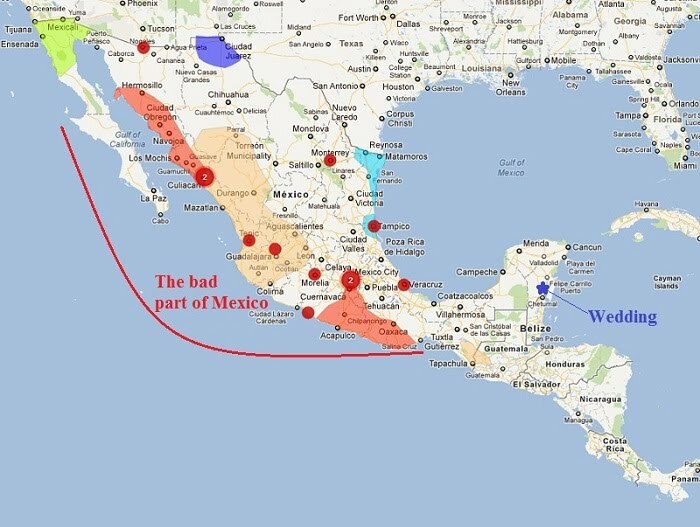 Not visiting Mexico because of the drug violence is roughly equivalent to avoiding South Carolina because of gang wars in New York City (or skipping London because people of the Isle of Skye are getting frisky). The area is very heavily traveled by American and European tourists, the roads are good, and the crime rate is reported to be lower than in most areas in the US (0.1 murders per 100,000 people in 2010, vs. 11 murders per 100,000 in Orlando, Florida). We traveled the entire Yucatan peninsula by car in 2007, and never felt threatened or unsafe. We were just recently in Cancun, Playa del Carmen, and Tulum for wedding planning. We chose this area to get married in because we had such a wonderful experience there, and would NOT have the wedding there if we were even remotely concerned about the safety of our family and friends. We can assure you that the Mayan Riveria is beautiful, the food is to die for, and the people are warm and friendly. The news stories you’ve heard about terrible drug violence were nowhere near there. That being said, you should of course take the same precautions you would normally take when traveling to a foreign country to keep yourself safe. Be aware of your surroundings, don’t flash large amounts of cash around, keep your valuables on your person, and use common sense.